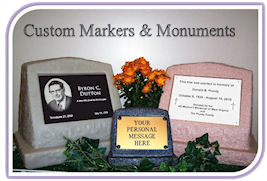 This Guide offers some explanation about information that we will need to custom design a Plaque for you. The first two fields are the only ones that are required. The remaining fields are available for you to offer some guidance to us for our design effort. You are free to use them as you see fit. Name: Used to match up the design requirement with your order. Email: Used to match up the design requirement with your order. Area Code and Phone Number: Only if you wish us to call you, if we have questions. Otherwise, we will contact you by Email. Tell Us a Little About the Person Or Pet: Free text which should mention any special thoughts, qualities, relationships, memories, dates, etc, which we will draw upon, if you do not submit actual text in the next field. Plaque Text: If you know exactly what text you would like, please put it here. If you want the text to be split at specific points, hit the “Enter” key to start a new line, then continue with more text. Normally, we trim leading spaces, but, if you put in multiple leading spaces, we will try to honor that in the layout. Text Location: Select one of the choices. If you want a more complex layout, such as, half top and half bottom, please use the “Special Layout Instructions:” found below. Should text be one line or multiple lines: General guideline to us, if we are creating the text for you. Photo: Color or black and white photos are fine. If needed, we will convert color photos to grayscale, which is a form of black and white. If your photo is not digitized, such as an old-style printed photo, you will need to get it scanned or contact us for special arrangements. Please note that the photo type must be one of these: GIF, JPG, JPEG, or PNG. Most of the digital cameras and scanners, in use today, create images that are too large for use on these Plaques. We will shrink and crop the image, as needed. Split text left and right with photo in the middle. Split text top and bottom with photo in the middle. Any other way you wish. We will attempt to accommodate your suggestions. CAPTCHA Code: This is used to stop spammers from clogging our mailbox. Lowercase letters are fine. The code is not case sensitive. If you need more guidance, before filling out the form, please visit our Contact Us page to ask your question(s) and let us know how to reach you.